Bug#262; Package not_applicable. (Fri, 12 Jul 2013 06:33:02 GMT) Full text and rfc822 format available. New Bug report received and forwarded. Copy sent to owner@bugs.x2go.org. (Fri, 12 Jul 2013 06:33:02 GMT) Full text and rfc822 format available. We are trying to move from NX to X2Go. 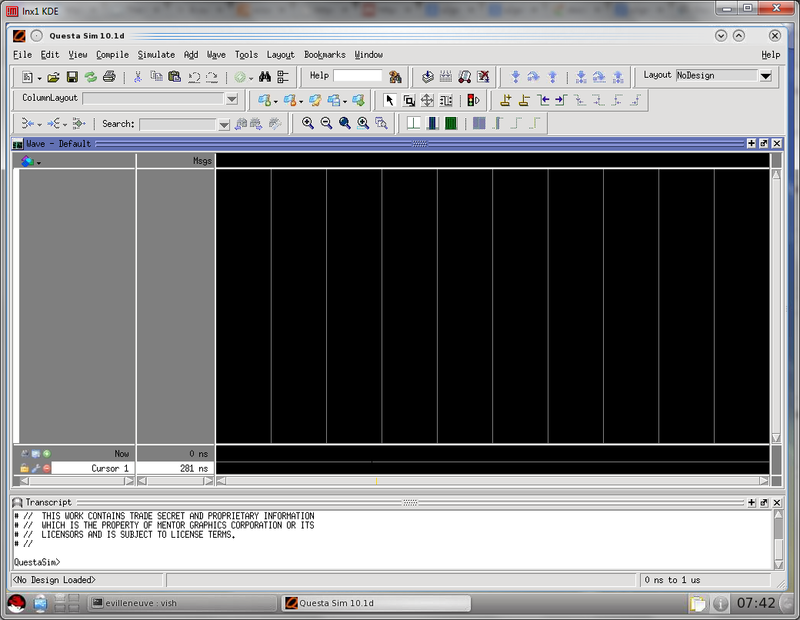 One of our tools is called Questa Sim (EDA tool from Mentor Graphics). When we used to run it from NX, no issues. … black text on a black background, hence not readable. Bug#262; Package not_applicable. (Fri, 19 Jul 2013 16:18:01 GMT) Full text and rfc822 format available. Extra info received and forwarded to list. Copy sent to owner@bugs.x2go.org. (Fri, 19 Jul 2013 16:18:01 GMT) Full text and rfc822 format available. > We are trying to move from NX to X2Go. > One of our tools is called Questa Sim (EDA tool from Mentor Graphics). > When we used to run it from NX, no issues. > … black text on a black background, hence not readable. Do you have a clue how this can happen? Any chance that this needs some more fine tuning? of hours of paid coding work. Is that feasible for you business? Bug reassigned from package 'not_applicable' to 'x2goagent'. Request was from Mike Gabriel <mike.gabriel@das-netzwerkteam.de> to control@bugs.x2go.org. (Fri, 19 Jul 2013 16:18:02 GMT) Full text and rfc822 format available. Bug#262; Package x2goagent. (Mon, 22 Jul 2013 10:48:02 GMT) Full text and rfc822 format available. Extra info received and forwarded to list. Copy sent to X2Go Developers <x2go-dev@lists.berlios.de>. (Mon, 22 Jul 2013 10:48:02 GMT) Full text and rfc822 format available. The impact was too problematic so we had to uninstall X2Go and reinstall NX. not reproduce on a new environment. >  We are trying to move from NX to X2Go. >> One of our tools is called Questa Sim (EDA tool from Mentor Graphics). >> When we used to run it from NX, no issues. >> … black text on a black background, hence not readable. > Do you have a clue how this can happen? > Any chance that this needs some more fine tuning? Bug#262; Package x2goagent. (Mon, 30 Jun 2014 13:25:02 GMT) Full text and rfc822 format available. Extra info received and forwarded to list. Copy sent to X2Go Developers <x2go-dev@lists.x2go.org>. (Mon, 30 Jun 2014 13:25:02 GMT) Full text and rfc822 format available. were not present in NX sessions. feedback, if you also see those color issues on fresh installations? Please test with the currently baking builds of NX (redistributed) 3.5.0.27. Added tag(s) moreinfo. Request was from Mike Gabriel <mike.gabriel@das-netzwerkteam.de> to 262-submit@bugs.x2go.org. (Mon, 30 Jun 2014 13:25:02 GMT) Full text and rfc822 format available. Bug#262; Package x2goagent. (Mon, 28 Sep 2015 09:00:05 GMT) Full text and rfc822 format available.